Broad Pass - Late April 2009: Ever since I saw Cory Smith's pictures of fine crust skiing at Broad Pass a few years ago (with Scott McArt and Bill Pearson) I figured I should go and check it out. It's a long drive to the Broad Pass/ Cantwell area, about 200 miles from Anchorage. The snow at the pass was very slim this year. And near Cantwell there were caribou out walking on bare tundra. 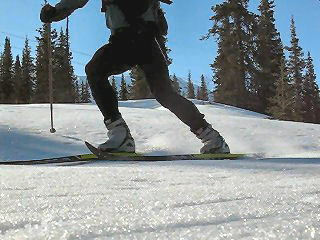 But south of the pass, behind the "Igloo", there was decent crust skiing. Was it worth the drive? Just barely. Maybe. The crust was thin and went quickly around 11:00 AM. But I was was able to ski some new country... and get ideas for future ski trips. 360 degree panoramic taken while crust skiing in the Broad Pass area. Resort hotels and fancy restaurants are a big part of Alaskan crust skiing. ;-) The south (left) and north summits of Mt. McKinley. The Intertie electrical transmission line goes through here. The best crust skiing was in the woods. I sure like the mountains to the east of Broad Pass. On the way back I skied by the igloo. Is this really an igloo? Heck yeah ... just read the sign! Crust has a way of telling you when your time is up. 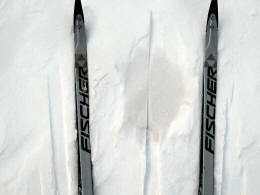 This crust got soft in a hurry (11:00 AM) due to sun and 60 degrees F. Happy skis - drying in the sun. Big Lake - Late April 2009: When late April conditions aren't panning out for good crust skiing around Anchorage (or you want to try someplace different) ... then Big Lake often delivers. Mid-April is about the time when folks stop driving vehicles on the lake's ice roads. They stop driving the ice roads not because the ice is too thin, but because it can get too sloppy on top of the ice. 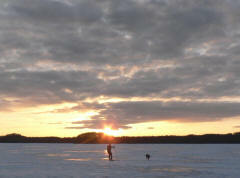 For two to three weeks after the driving stops the ice remains good for snowmobiling, 4-wheeling and ... crust skiing. This was a 25 mile crust skiing loop similar to the Nordic skating loop I did in early November 2008. Corn snow and crust on top of Big Lake ice. Someone that weighs much more than me was walking out on the ice ... a moose. I checked the ice depth at old ice fishing holes. The ice was still over two feet thick (distance from my thumb to the pole basket). This is the only floating cabin I've seen on Big Lake. It's got a walk-around deck with an anchor winch and grill on it. It's quite the pad. It was a cold winter ... but luckily the Big Lake palm trees survived! Portage - Late April 2009: I wanted to check out the rock slide that shut down the road to Whittier. So what better way to check it out than via crust skiing. Here's the rock slide. You can see that the slide pushed the guard rail towards the lake. The road is officially closed, but actually - it is open somewhat. I saw pickup trucks driving back and forth across the front of the rock slide. There is a lot more snow in the Portage Pass area than last year. The crust skiing was really good when I was there. However, due to cloud cover the light was pretty flat - which made for slower descents. A bonus here is that there is very little sign of ash. But that will likely change as more melting kicks in. I did a bunch of skiing to the west of the Byron Glacier access road. There is some good open forest skating there. And then you can hook into the "Trail of Blue Ice", which is partially completed (completion will be this summer?) There was still 3 feet of snow on top of some of the trail bridges. And there were some neat looking "hairy" cottonwoods in the area. This sign was by the lake. If heavy equipment is working at the slide site and trucks are hauling rocks, like the day I was there, then they certainly aren't blasting. It's spring ... lots of people regularly ski on the lake. The state should acknowledge this and remove this sign when they are not blasting. April 2008 April 2009 It looks like the old weather station did not get blown away by high winds, but rather it was removed by cutting the anchor posts. According to the Superintendant of Chugach State Park they did not remove the cabin. They do believe it was the [NOAA] weather service that may have removed it. Maybe the wind finally blew it away, or, the River Forecast Center is replacing it with a new one. Would These Be Called: "Ashholes"? I looked in my textbooks about arctic geography, geology and meteorology and I can't find a name for these volcanic ash deposits that accumulate on the downwind side of snow drifts. The lower albedo of the ash causes warming and a melt hole in the snow to form. So it seems that a logical a name for this phenomenon would be: ashholes. Besides being a logical name, it is an easy name to remember and has a nice ring to it. A big ashhole blocks the trail. Wow! What an ashhole! Where did all these ashholes come from?! Who invited these ashholes? Watch out for that ashhole! What a bunch of ashholes! These ashholes sure messed up our crust skiing! Hatcher Pass - 19 April 2009: A popular ski tour is the Hatcher Pass traverse. 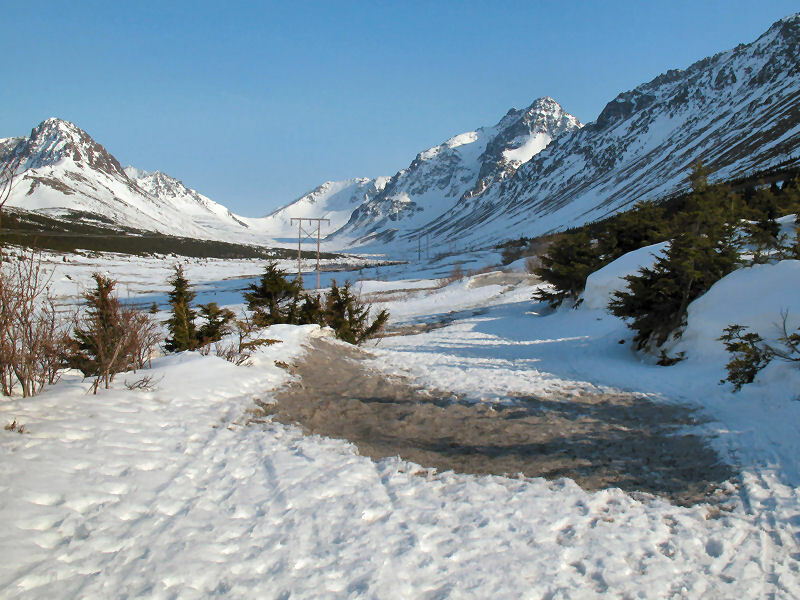 Skiers usually start at the Hatcher Pass Lodge, ski up over Hatcher Pass and then down a long gradual descent to where the plowed section of the Willow Fishhook Road ends - a point-to-point total distance of 15 miles or so. I figured I'd try and do an over and back 30 miler on this route. Volcanic ash was a factor in this ski, but a light, new snowfall helped clean up the snow at higher elevations. Ash or not, this double traverse is a scenic and fun ski with a lot of climbing rewarded by long downhill cruising. The route. Over and back is about 30 miles. Hatcher Pass snowmobile trail sign. Avalanches and volcanic ash in the background. Working the grind to the pass. At the pass, looking back east. Looking west towards Willow. Didn't see many people. Here a couple of folks were taking their dog for a ride in a Polaris Ranger. Along Willow Creek there was some super fast wet granular snow on top of ice. The turn-around. 50 percent of the distance is over, but only 25 percent of the effort. It's a long climb back to the pass. These signs are all over Alaska - wherever they don't plow state roads in the winter. The fish of Willow Creek are not going to be happy. They are going to be tasting a lot of volcanic ash. 12 miles? Maybe that should be "12 gauge". Ugly. Cleaner snow up high, due to recent snowfall. Dogsled Pass in the distance. 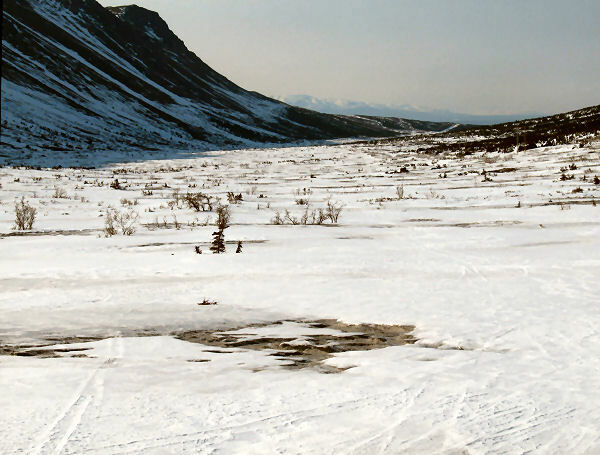 Ski tracks indicated that two skiers made this traverse from east to west the day before. I LOVE SNOWMOBILERS! They are so thoughtful and kind! They must have known I was getting hungry climbing back up to the pass, so they dropped their lunch for me on the trail! Oh ... you guys shouldn't have! The chocolate and coconut macaroon cookies really hit the spot! Thanks sledheads ... you guys rock! PS - Maybe keep that pack zipped up better or some skier might pick up your wallet and credit cards the next time! ;-) South facing slopes have melted out and are showing the volcanic ash that lies under a thin layer of new snow. I guess winter is on its way out, because back at the parking lot I saw my first RV of this year's tourist season. The owners sure had one vicious guard dog!! Palmer - 19 April 2009: Aufeis ... what's that!? 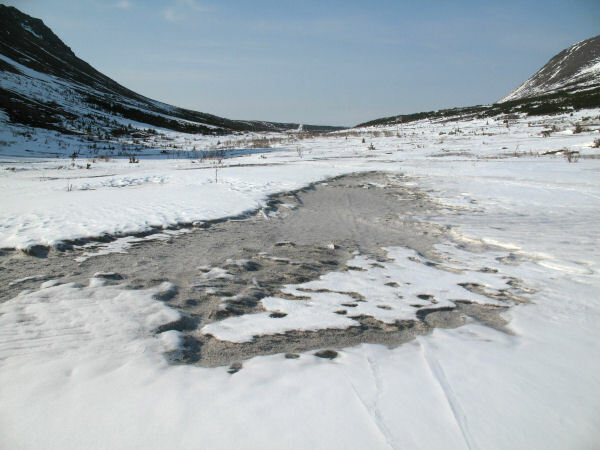 Aufeis is a sheet of ice that rests on gravel bars of a river. 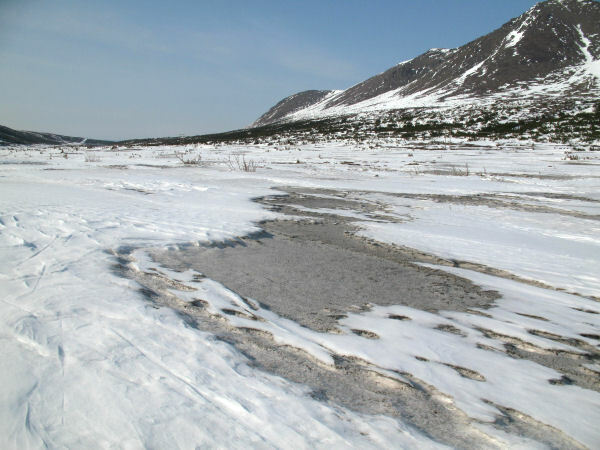 It's caused by extreme cold temperatures causing ice jams in rivers that force the flow of water to spread over the river's flood plain and freeze. Usually you have to go to someplace way north like the Brooks Range to experience aufeis. But thanks to the exceptionally cold winter we just had ... there is aufeis galore on the Matanuska River just east of Palmer. So if you want to be able to say: "Yeah ... I've skied aufeis! ", then you better make a trip to the Valley and check it out. A panoramic picture of the Matanuska River flood plain. Aufeis can be seen from bank to bank, with the Matanuska River cutting through the middle of it. Trapper Creek - Mid April 2009: On Easter Sunday I went for a 28 mile ski on the Amber Lake Trail. The trail was good skating while it was frozen. But as the temps warmed and it started to rain - wet snow mixed with volcanic ash made for painfully slow skiing. Unless there is an unseasonably cold and clear spell in the next week or so ... I think this is my last Susitna Valley ski for the season. Time to head to higher ground. 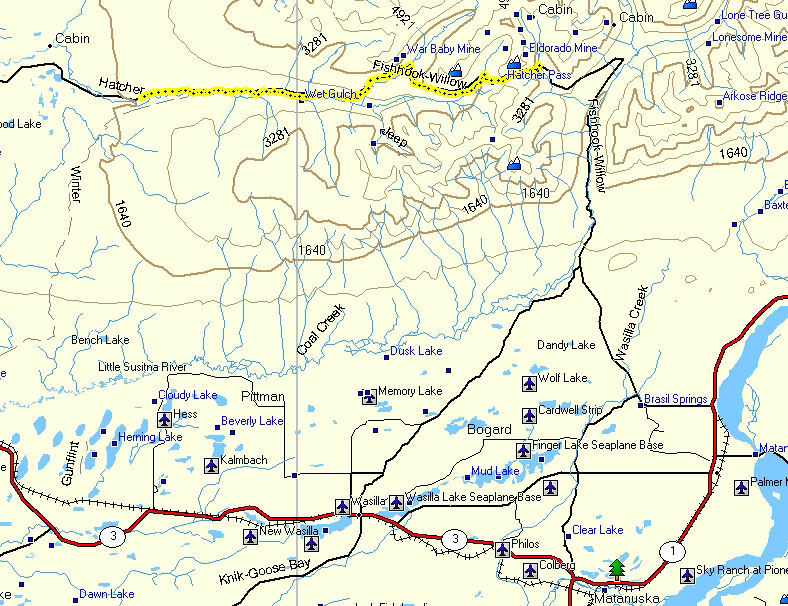 The Amber Lake Trail follows some long seismic line cuts. Volcanic slush ... very slow skiing. A farewell salute to the Su Valley trails. It was a fun winter of skiing in the Su Valley. Can't wait until next winter. Ed Plumb and pals' White Mountains ski epic, without snow. 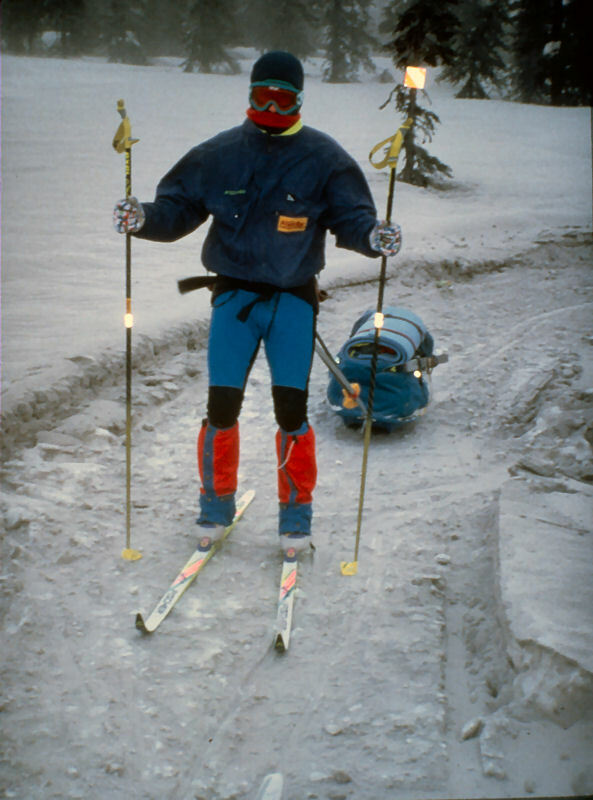 Patrick Salton's crust skiing on Kodiak Island. Chris Stromberg's skating lake ice on metal edged xc skis. The Palmer, AK high school ski team's video that proves Moose can fly! White Mountains - Early April 2009: One of the favorite places my wife and I liked to take our dog team of Malamute pals was the White Mountains National Recreation Area north of Fairbanks. Our dogs have passed away, but our fondness of the BLM trail and cabin system of the White Mountains lives on. 12 years after our last mushing / skiing trip to the White Mountains we went on a snowmobile-supported skiing trip in these hills. 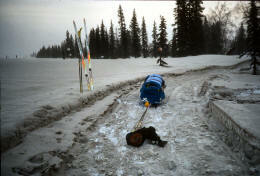 We took turns skiing while the other drove the snowmobile pulling a sled with our supplies. The nice thing about this arrangement is that you can cover a lot of miles during the day because you can ski fast and free due to not having to huck a big pack or pull a sled. At nights we stayed in pay-for-use BLM cabins (though we carried a tent in case our plans are forced to be changed). This was the first time I had ever done a snowmobile-supported multi-day ski trip. And I don't think it will be the last time! It can be a great way for folks of different skiing speeds to cover a lot of country together. I like to start from a "backdoor" of the White Mountains (that is - not at the Wickersham Dome trailhead). It's a lot quieter. Here I am at Mile 57 on the Steese Highway next to a remnant of the "Davidson Ditch". The Davidson Ditch was an 83 mile system of ditches and inverse siphons, built in 1925, that supplied water needed by floating gold mining dredges in Fox, AK. From the Steese Highway Mile 57 it is almost 4 miles of continual uphill to the top of the ridge. Quite the grunt. But it is soon forgotten as you cruise the ridgetops with great views in all directions. 360 degree panoramic view of the White and Steese Mountains from the top of the US Creek Road climb. Heading down the Nome Creek drainage. One big change that's easy to notice in the White Mountains since 12 years ago is the affect of forest fires. Fire has ravaged much of this area since then. Switch time. My wife is getting ready to ski, my turn to drive. This is a 4-stroke snowmachine - fuel efficient, low emissions and ... quiet! We stayed at BLM (Bureau of Land Management) cabins. This one was my favorite - the Wolf Run Cabin. It's practically brand new. It was built in 2006 to replace another cabin at this same site that was lost in a forest fire. Probably the most defining area of the White Mountains, and my favorite, is the Windy Gap and Fossil Creek Valley area. Windy Gap 360 degree panoramic view. The Fossil Gap Trail is also very scenic. Along Fossil Creek we saw the aftermath of nature's brutality. A big wolf pack was in the area. Here is a wolf's paw print where you can see it's claw drag marks in the snow. On Fossil Creek there was a wolf super-highway and an area where the wolf pack had stopped and congregated. Tufts of moose hair on the trail indicated that a moose had been attacked by the wolf pack. And the moose had began a futile run for its life. A half mile down the trail the chase ended where the wolf pack took down the moose and devoured it. Looks like it was a young moose. Little moose don't have a chance if a big wolf pack targets them. I should make a disclaimer of sorts concerning snowmobiles. Using a snowmobile for remote backcountry access can be great. But it can also be dangerous. A snowmobile adds a new layer of potential problems you may have to deal with in the middle of nowhere: engine malfunctions, getting stuck, sliding off overflow glaciers into the trees, tipping over on side hills, parts breaking, etc. An ideal situation would be to have two snowmobiles in your group in case one machine dies. My wife and I use one snowmachine of course on ski trips, which ups the risk factor in case of breakdowns. We rely on decades of snowmobiling experience dealing with just about everything and anything that can go wrong with these machines. That helps us to prepare for and deal with 80 to 90 percent of snowmobiling challenges. But we know there is always the 10 to 20 percent chance of a problem that will be very tough for us to get out of. So if you want to use a snowmobile for backcountry access, take the time to learn how to troubleshoot and fix it and get your skill level up for driving it in challenging terrain. This is a grass tussock that I found lying loose on the trail. Tussocks on the side of the trail can cause my wife to catch a ski tip while skating, do a face plant ... and then say some very colorful words !! ;-) Broken sled hitch. We were prepared for this mishap so it only took a minute to fix this problem. Steese Mountains - Early April 2009: Unique and fun spring skiing can often be found skiing the trails on mountain ridges to the northeast of Fairbanks. The ridges are often wide-topped and long and you can cruise with "top of the world" views for long distances. But be willing to pay for ridgetop access with long climbs, and be prepared for ripping descents on the way down. Trails in the Chena River State Recreation Area access such ridges to the north of the Chena Hot Springs Road. The Yukon Quest trail travels along high ridges from Circle Hot Springs to near Chena Hot Springs (I've done this trail segment twice). Other neat skis are the Far Mountain Trail, Haystack Mountain north of Chantanika Lodge and the Charlie Dome cat trail above Chena Hot Springs, pictured here. Near the top of Charlie Dome, looking down at Chena Hot Springs Resort. Cat track (for hauling aurora viewers) near the top of Charlie Dome. Nice glade skiing descending through the sparse spruce up high on this ridge. 360 degree panoramic view from the area of Chena Hot Springs Resort's aurora viewing yurts on top of Charlie Dome. People come here at night, so if you ski here during the daylight hours you probably won't see anyone. Mendeltna - Early April 2009: If you are a skier, the location of Mendeltna Creek Lodge can work out well for you. If you want to break-up a drive from Fairbanks to Anchorage via the Richardson and Glenn Highways, I've found this place is a good place to stop. The next day you put your skis on outside your door and get a ski in before traveling to Anchorage. It also makes for an after-work travel / ski the next day option from Anchorage or the Valley. Besides the snowmobile-groomed ski trails here, there is also the Tazlina Lake Trail. This 8 mile trail leads to a huge lake fed by Chugach Mountain glaciers. Russ and Mabel Wimmer run the Mendeltna Creek Lodge. You can stay in their lodge or in rustic cabins that are inexpensive. And for breakfast - Russ sure makes a killer Mendeltna Breakfast Sandwich !! Skiing the Mendeltna Creek Lodge Ski Trails. Skiing down the 8 mile Tazlina Lake Trail (that Russ Wimmer keeps brushed). The Tazlina Lake Trail next to Mendeltna Creek. Nice trail. The Tazlina Lake Trail goes past ruins of an old trapper's cabin. If you notice on the rightmost picture - the cabin was insulated with moss and saplings were nailed on the logs to keep the moss in place. Old school! Skiing on the Nelchina River delta. Big Lake / Houston - 30 March 2009: While skiing the Susitna Valley Winter Trail a couple of weeks ago, a Big Lake Trail System sign reminded me that there were some trails to the north of Big Lake I had never skied before. I couldn't have trails I've never skied in the Lower Susitna Valley hanging over my head ... so I set off to check them out. I skied from the North Shore Park on Big Lake to Houston, then took the Little Susitna River and snowmobile trails west and south to Big Lake. One half inch of new snow had covered Mount Redoubt ash fall from two days ago, so the skiing was pretty good. Nice, quiet loop. I did not encounter any snowmobiles, just a few vehicles on the Big Lake ice road. 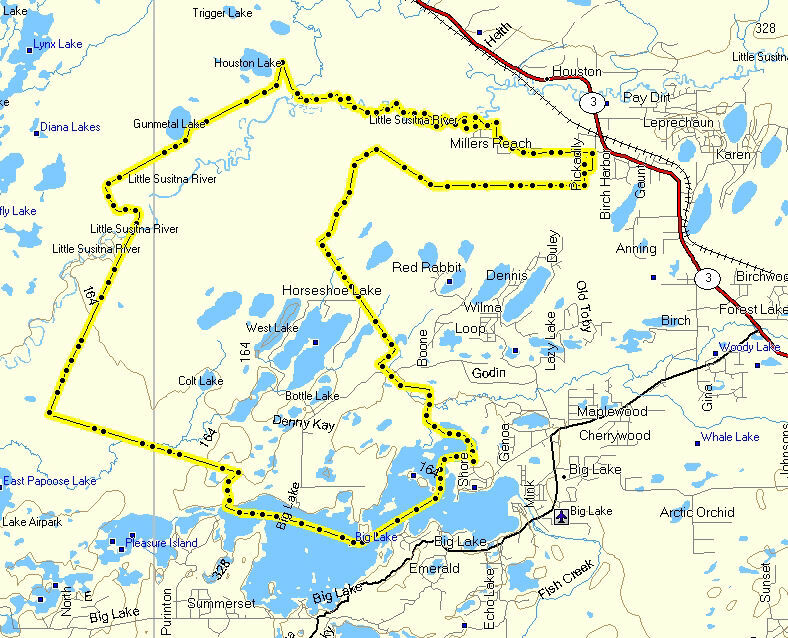 Big Lake trail system map. GPS track: 34 miles. Trailhead on north shore of Big Lake. Snowmobile stop signs. These seismic line trails traverse the area that was scorched by the 1996 Big Lake wildfire. Many fire-killed black spruce trees can be seen in this area. Must be springtime, trees are starting to Bud! Following the Intertie, where I missed a turn ... ... and ended up in a place I REALLY DID NOT want to be! Good skiing on the Little Susitna River. Looks like maybe sport fishermen cut up sweepers so they wouldn't be a problem come fishing season. Just a guess. I really liked the trails to the north of the Little Susitna River, near Nancy Lakes State Park. Skiing all day was on light snow on top of Mt. Redoubt ash. 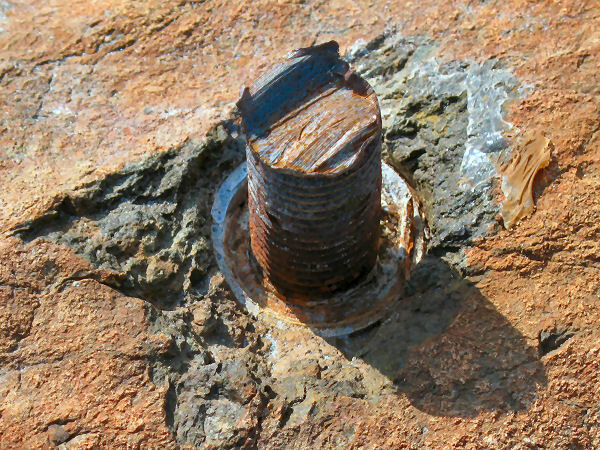 Old trail marker. New trail marker. Seismic line heading south to the Iron Dog Trail. Heading back across Big Lake on the ice roads. While skiing this loop I looked for the Castle Mountain Fault. This is a major earthquake zone that comes through this area and supposedly you can see where it has uplifted on the north side of the fault. Here is a web page about the Castle Mountain Fault by USGS geologist and fellow cross country skier Peter Haeusller, and Keith Labay. Judging by Peter's map of where the fault is, the picture above is where I think I crossed it. It was where a low east-west ridge dropped down to a swamp. But I can't say for sure that this is the fault line. Thanks Peter and Keith for the interesting information about this unique geological feature in the Susitna Valley !! Late March 2009: No crust skiing in Southcentral Alaska yet, but Chris Stromberg and his posse of Canadian and Minnesotan xc skiers have been crust cruising away at the beautiful Quetico Provincial Park in Ontario. Looks like you folks have some good skiing going on! Cheers from Alaska! The picture on the right is of the legendary White Otter Castle, now a crust skiing destination! Chris Stromberg says: "The Castle" was made by a Scotchman at the turn of the century. For the most part he made it all himself. All the massive windows on all 4 stories were brought in by canoe. At the time this was 30 miles from a train station. It is now a 25km ski. (50km return)." Anchorage - 29 March 2009: Photos of Mt. Redoubt ash, that fell in Anchorage on March 28th, on the Hillside ski trails. Mount Susitna - Mid-March 2009: My wife and I tried to ski up the North Ridge of Mount Susitna earlier this winter, but deep snow and no trail discouraged us and we decided to try again later. Going back in March we found a good trail to tree-line. And then good classic skiing on windblown snow on up the ridge, with a stiff north breeze pushing us along. 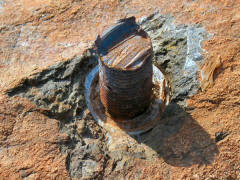 The last step on the ridge had a wind-hardened crust on it, as did the last rise to the summit. My wife is smart enough to not climb this stuff in slippery cross country racing boots, so she let me prove I was less smart and I scrambled to the North Summit. 5 snowmobiles arrived while we were on the ridge and they broke up the sastrugi and made a good trail for coming back down. Leaving the trees behind and heading into the great wide open. The North Summit of Mount Susitna comes into view, Half-way up the ridge we found lots of kiting tracks. I believe these tracks are from the Best pro kitesurfing team, flown out here by ChaplainAK Air. On clear days Foraker and McKinley watch you as you ski this ridge. Holy crap! This amazed me. Moose poop at 3900 feet. The Main (left) and North summits of Mount Susitna are in the distance. So basically, this moose in on the top of Mount Susitna in the winter. Crazy moose ... WHAT are you doing up here!?!?! I left my skis at the base of the summit ridge and kicked steps on up. Here you can see footsteps in relief from the kite skiers (I assume) from prior to the last wind storm. If you expand this picture you will see 3 (out of a group of 5) snowmobilers heading to the final steep step of the ridge. They had to fight to get up and over this pitch. One guy rolled his sled trying. But they all eventually made it. Good going dudes! On the North Summit. This was a "three-peat" of sorts for me. I had been up the South and Main summits of Mount Susitna earlier this winter. 3 times in one winter ... you might get the idea I like rambling around Mount Susitna. Yep, I do. This snowmobiler made it over the last step and then went back to encourage the others to give it a try. He drove up to my skis, took a picture of them, looked up and saw me descending and took off before I could talk to him. That's snowmobilers ... always afraid of big, meanie cross country skiers! Mount Susitna North Summit panoramic - looking east. Mount Susitna North Summit panoramic - looking west. 18-19 March 2009: The big deal in the Susitna Valley this winter was the official link-up, marking, grooming and opening of the Susitna Valley Winter Trail (SVWT). 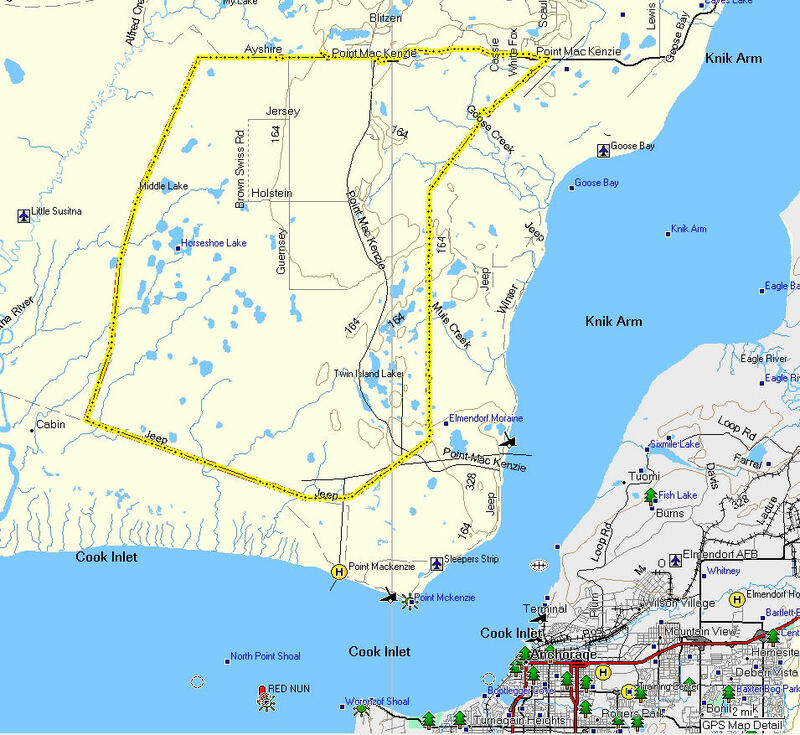 This 120 mile trail, from Denali State Park at mile 131 on the Parks Highway to the North Wayside Park on Big Lake, creates a "backbone" trail for the Susitna Valley. The official opening of the SVWT was the weekend of March 14-15. Valley trail clubs scrambled to get the trail marked with brand spanking new signs and get the entire trail groomed before the grand opening. The true official opening of the trail was the moment Governor Palin cut the SWVT ribbon at Susitna Landing! I waited until after the party to ski the length of this trail. I did it as an overnight camp-out trip that took me two days. Things had sure quieted down. I encountered only 13 snowmobiles and two four wheelers in 120 miles. Beautiful weather, fantastic trail ... the SVWT is yet another reason to love the Susitna Valley!! Here is the State of Alaska Department of Natural Resources map of the Susitna Valley Winter Trail (6MB pdf file). Trapper Creek: No sense in driving to WalMart in Wasilla, when you can snowmobile to WalMike's !! The Curry Ridge Riders' gorgeous Chulitna Bluffs Trail. The Curry Ridge Riders' monster trail drag. Mile 7 of the Curry Ridge Riders' Rabideax Trail. Start of the Mid-Valley Trail Club's Trapper Lake Trail. There are plenty of views of the Alaska Range on the Trapper Lake Trail. Recent winds had blown out some of the Trapper Lake Trail, but it was still decent skating. A mid-day refill of the drinking bladder from an insulated reserve bottle I carry in the sled. Near Trapper Lake some very freshly groomed trail showed up. Skiing the Big Susitna River towards Susitna Landing. No question ... I turn right here! ;-) Sunset while skiing the SVWT to the west of the Delta Islands. Camp for the night. Dawn ... time to get going. Skiing the Mid-Valley Trail Club route west of the Delta Islands. An unopened gift from my snowmobiler pals. The Willow Trail Committee's nicely buffed Deshka Crossover Trail. Cruising the Big Susitna River towards Deshka Landing. The Iron Dog Trail heading towards Big Lake. Big Lake ice road. Heading to the Big Lake North Wayside ... the finish. Waiting for my ride, eating frozen cheese ... and scheming my next ski trip! THANK YOU!!! To the State of Alaska Department of Natural Resources and their SnowTRAC program, the Matanuska-Susitna Borough, the Curry Ridge Riders, the Mid-Valley Trail Club, the Willow Trail Committee, the Big Lake Chamber of Commerce, Governor Palin and others for your efforts in creating the Susitna Valley Winter Trail. You have created an outstanding winter recreation asset for the Susitna Valley of Alaska. Your efforts are very much appreciated!! 15 March 2009: This evening the view of Mount Redoubt from Anchorage showed this volcano spewing some steam and ash. And with the strong north wind that has been in action, a long thin plume of ash was flowing south. So what is it with Mount Redoubt? Why does it always act up during the Iditarod? The Iditarod is going on right now. 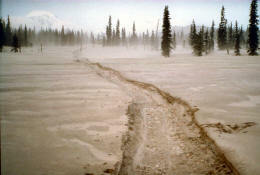 And in 1990 when Mount Redoubt blew ... it hit the Iditarod Trail with a blanket of ash while the race was in progress. Pictures of volcanic ash in the Lower Susitna Valley from the Mt. Redoubt eruption of March 21, 2009. The ash fallout here was very light. You could only see the ash where wind had accumulated it in depressions (like moose hoof prints in the snow) or on snowdrifts along the rivers. Picture of Mt. Redoubt ash that fell on Anchorage March 28, 2009. Skiing was great in the morning. But a then big cloud of ash rolled over Anchorage and skiing was shut down. 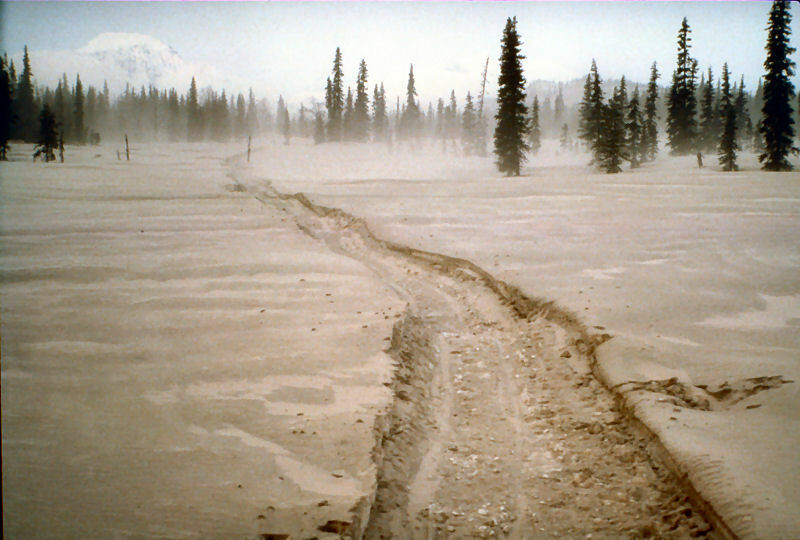 1990 pictures of an ash covered Iditarod Trail near Finger Lake. 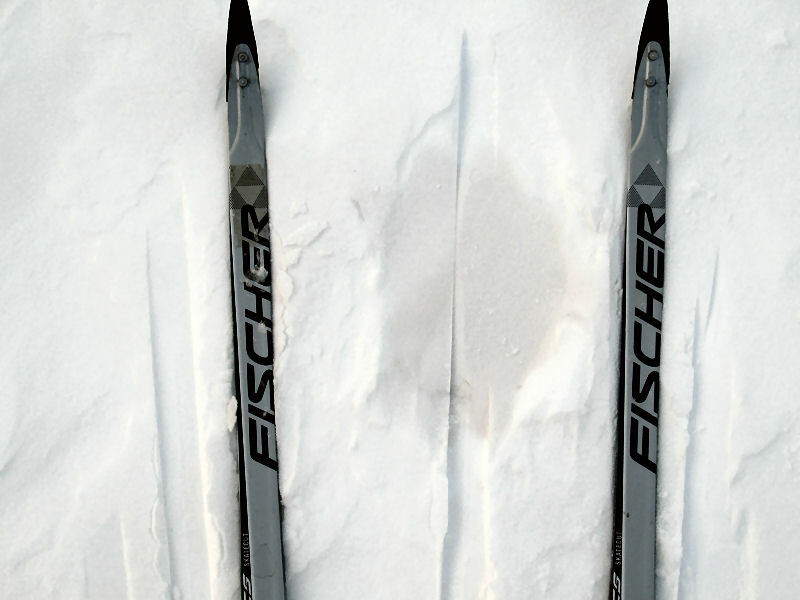 Skis have great kick on fresh volcanic ash. But zero glide. Just kidding: There is no shame in giving or receiving help in the backcountry. But I am starting to collect pictures of situations I've encounterd on ski trips where I, a lowly cross country skier, have helped out snowmobilers in distress. I'm not being judgmental about this at all. I'm a snowmobiler too, and I have crashed, rolled, stuck, broken and buried my sled MANY times! I know that doo-doo can happen ... so I always have time on ski trips to help out snowmobilers when they are in a pinch. Yeah that's right snowmobilers ... I know it's hard to believe. But there are actually a few cross country skiers out there that are good folks! I used my skis to stamp out a 50 foot ramp up out of this creek bed so this guy could get out. These were tough climber dudes. They would have gotten this sled out without my help. But I helped them anyway. And I'll never forget the time I had the privilege of helping out Alaska's most badass and beautiful snowmobiler woman when she was in distress!! Point MacKenzie - Mid March 2009: The infamous Knik Arm "Bridge to Nowhere" was to be a link between "Somewhere", Anchorage, and "Nowhere", Point MacKenzie. The ski trip documented here turned out to be a fine loop around the promised land of Nowhere. Starting at the Point MacKenzie General Store this 39 mile route went out Ayrshire Road, took a right into the swamps at the Susitna Game Flats Preserve boundary, headed south on seismic lines to the electrical transmission line, followed the power line east and north to Goose Bay and the Pt. Mac road, and then followed the road west ... back to the store. It's amazing when you think about it. The Tour of Somewhere (Anchorage) ski route has been skied many tens of thousands of times. But less than ten miles away from that popular ski trail, in the middle of "Nowhere", there is a logical and neat ski loop that had likely never been skied until this day. So ... I call this loop - The Tour of Nowhere! I really like Nowhere. And I hope Nowhere does not become Somewhere for a very long time. GPS track: 39 miles. Start and finish at the Pt. Mac. General Store. Same price to park here as Mat-Su trailhead but better security. Store owners Julie and Jeff are super nice folks. Ayrshire Road. Following Nodwell tracks. Following seismic lines south across the swamps on the east side of the Little Susitna River. Staying hydrated while skiing the seismic lines. River otter tracks. This is where the seismic line I skied across the swamps hits the power line corridor. Good skating under the power line. This loop was about 60 % classic, 40 % skating. A number of creek crossings break up the power line route. Looking south towards the substation that sends power below Knik Arm to Anchorage. While skiing the power line I noticed 3 iron crosses (click on picture at left and you will see them near the bottom). Apparently they are memorial markers for three men that died in 1971 when their small plane had a horrific collision with the power lines. Looking back southwest just after crossing the Point MacKenzie Road. The terrain on the east of Pt. MacKenzie is part of the Elmendorf Morraine. Lots of steep ridges here, left over from the terminus of a large glacier of the last ice age. Power line heading north towards Goose Bay. This was my favorite section of the loop, good classic skiing (Special Red was the wax of the day). Crossing Goose Bay. Nice trail heading north of Cameo Drive. If I lived here, I would be home by now. The steepest hill on this loop is less than 1/2 mile from the finish. Welcome to Holy Sh*t Hill. This ski loop went by the Point MacKenzie Correctional Farm. As I skied by the farm I had this realization: "Working on farms makes kids correct!? Wow! I worked on a farm for many years when I was a kid!! No wonder I'm always correct!!!" This is a Hercules C-130. A "Herc". The Alaska Air National Guard is often flying these very cool beasts over the lower Susitna River drainage on low altitude training missions. When you are out skiing you often see them. Some notable encounters I have with Hercs have been at night while I've been snowmobiling. The pilots of the Hercs often fly right over the Gas Line Trail which many folks use. So there have been a couple of times when I have been cruising along on a snowmobile and start hearing this ambient low rumbling. I start to get a bit spooked ... what the heck is that sound!? Then the lights of the Herc and it's HUGE belly come into view RIGHT above me! The plane has come from behind and is flying at what seems like about 50 feet above me! Ahhh! I went to the air show last year at the Anchorage airport and toured a C-130 Herc. There were a couple of Air National Guard pilots there and I asked them if they have fun scaring the crap out of snowmobilers on the Gas Line Trail. They started chuckling and giggling. "You don't hear us coming until we are right on top of you, do you!!! Ha! Ha! ", they said. I laughed too. It's actually pretty entertaining getting buzzed by these monsters. No! I'm not out whacking moose. It's the other way around. Moose have developed a very effective way of whacking skiers ... in the face! They do it with a devious trap they manufacture called a Moose-Whacker. To make this skier flogging whip they walk down snowmobile trails until they find a tasty birch or willow sapling. Then they grab up high on the tree, pull it down until it snaps, munch all the twigs off and then move on. What they leave behind is an eye-level whip just waiting to make a swift and painful whack against a skier's face! Come on moose ... skiers are your friends! Go pick on some wolves instead! A classic Moose-Whacker. Set and ready for an inattentive skier. Snowmobilers can go right under this Moose-Whacker ... ... but a skier takes it right in the face!! Goose Bay - Early March 2009: Recent snow and wind covered the trails I was trying to do a ski loop on this day. So I changed plans and spent most of the day exploring trails around Goose Bay, a place where I had never skied before. I parked at the Tug Bar near mile 19 of the Knik-Goose Bay Road. From there I took the Klondike 300 trail out into the Goose Bay region. I searched for and found a location I definitely wanted to check out - the Goose Bay Nike Site. This was a Cold War missile site that was in operation from 1959 to 1979. I had heard that this site had been razed. But apparently I had heard wrong. It still stands ... but it has been vandalized heavily in the past 30 years. The Tug Bar near the end of the Knik-Goose Bay Road is the start and finish of the Klondike 300 sled dog race. Good skiing on the K300 trail. And good skiing on an old roadbed that travels the bluffs on the north side of Goose Bay. Goose Bay. I need to go crust skiing here this spring. 1st bunker on the access road. 2nd bunker, used for missile motor storage. "Explosive load limit 27 missile motors ..." Main gate. Motor pool area. Remains of the guard dog kennels. Northern missile battery. "Explosive load limit 10 Nike-Hercules rounds ..." Inside the missile bunker. I doubt when this site was active that the folks stationed here ever imagined that some day a guy would be cross country skiing over the location where their Nike missiles were parked. Rails that the missiles (on launch cradles) would be rolled in and out of the bunker on. Southern missile battery. Structure between the two missile bunkers. 3rd bunker, to the north of the missile batteries. Remains of a double chain link fence that surrounded the facility. I'm a big fan of the Mat-Su Valley. But the end of the Knik-Goose Bay is basically an "Afghanistan in Alaska". It's a lawless area where the sound of gunfire is pretty much constant. It's very scenic country with fun trails. But there is sure a rough edge here. It's a war zone. An executed Cabbage Patch doll. I once read a Goose Bay Nike Site veteran's statement that some folks in the Goose Bay area (40 to 50 years ago) made cabins from the boards of the boxes the Nike missiles were shipped in. Cabins from missile boxes ... that is pretty amazing. I noticed these two old cabins in the woods near the end of the KGB road. It almost looks like they could be made out of missile box boards, but of course I don't know if they were or not. Mount Susitna - Early March 2009: A week before this trip I went up the South Summit of Mount Susitna with my wife. We did this trip as a "tribute trip" to our dogs, of which our last (of 5 Malamutes) died recently from old age. The South Summit was the route I used to take our dogs up Mount Susitna. The same day we were climbing the South Summit, Stu Grenier was leading a Mountaineering Club of Alaska trip up to the Main Summit via the Pierce Creek route he had pioneered during his multiple trips to the top of Mount Susitna. In an email after the MCA trip Stu said the Pierce Creek trail was in and to "Go Now!". I'd never been up his Pierce Creek route and I surely didn't want to let a good trail go unused! My wife and I tried this route the day before, but high winds kept us from going beyond the upper MCA campsite. The next day the winds died down and I did this route myself in 6 hours (3 1/2 up, 2 1/2 down). Above tree-line the trail was mostly blown over. But there were enough clues left so I could find the route. Thanks a lot to "Susitna Stu" and fellow MCA'ers for a great day on this cool route up Mount Susitna. I now owe the MCA to be their trail breaking grunt on the next winter Mount Sustina trip. 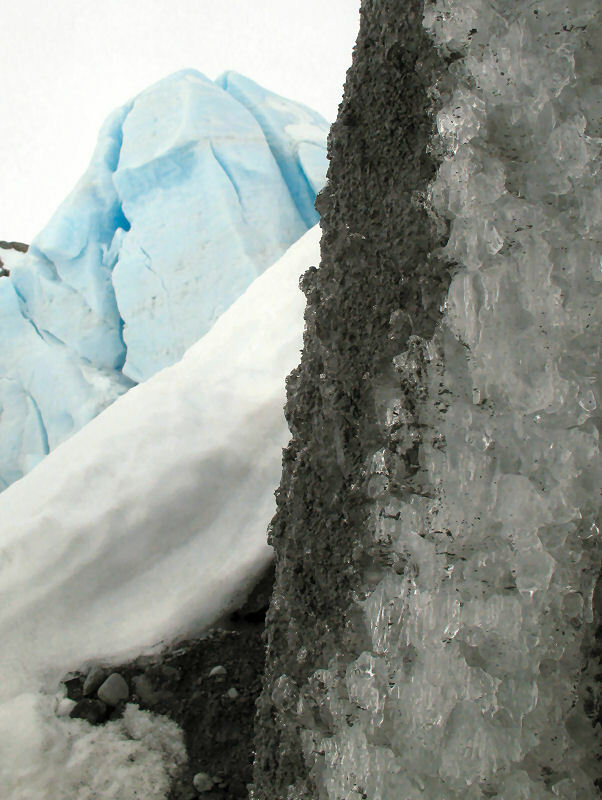 If you want to climb Mount Susitna, consider joining the Mountaineering Club of Alaska. For the past several years the fabled "Susitna Stu" Grenier has led winter and summer MCA trips up this peak. Stu has climbing Mount Susitna dialed in and MCA'ers have had fun trips up this peak recently on the trips he has led. Heading up Pierce Creek. 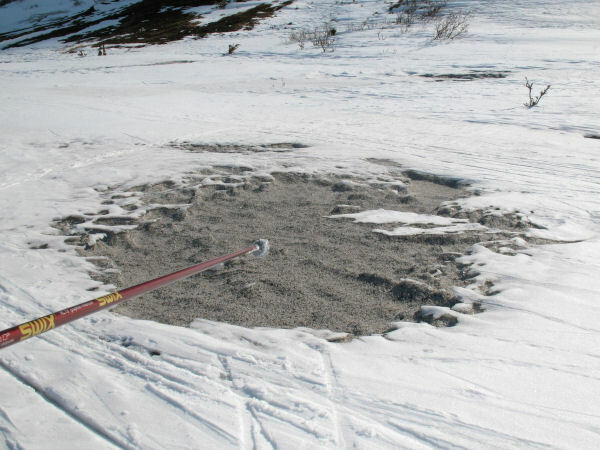 A hole dug by a lynx going after dinner. In the bottom right of this picture you can see a faint trace of the MCA trail. Heading into the Granite Creek gully. I like skis better than snowshoes. But skis don't cut it going up or down through Mt. Su alders. A snowdrift offers good travel above the alders. A blown-out section of the MCA'ers snowshoe trail. When I cache my snowshoes or skis ... I always tie them to something. You never know. Route to the top. A fun rambling ridge with great views. The summit is behind this GPS antenna that is part of a tectonic plate movement measurement station. On the summit. This was my 8th trip to one of the 3 summits (S, Main & N) of Mount Susitna. From the top you can see the start of the route - where Pierce Creek flows into Alexander Creek. This is a great route. I couldn't believe the size of the lenticular cloud plume being blown off of Mt. McKinley. Hiking out. The trail the MCA put in went through an area where there were a lot of spruce burls. Pretty cool. Mount Susitna Main Summit panoramic - looking east. Mount Susitna Main Summit panoramic - looking west. Susitna Valley - Early March 2009: My wife and I tried to go up to the Main Summit of Mount Susitna on this day via the Pierce Creek route. It was too windy to make it to the summit, so we hiked back out and did a snowshoe-bushwhack traverse over the length of Dinglishna Hill ... something we had never done before. A typically beautiful Susitna Valley cottonwood stand in winter. My new cabin is about done. I just need to install the door! Winds bash Mt. Susitna, viewed from MCA upper camp. Dinglishna Hill as seen from the Main Summit of Mount Susitna. Snowshoeing Dinglishna Hill (or Casper's Knoll as the locals call it). It was a windy and cold day as we did a quick bushwhack traverse over this unique 479 foot tall pluton. Descending the steep NE end of Dinglishna, and setting off a small slab slide. Whoops.